'The Board wants to silence me. So this is my website, and my way to talk to you,' John Schnatter says on the site. Papa John’s founder John Schnatter has lost his CEO title and board chair position as a result of racially divisive comments, but he hasn’t lost his majority stake in the company -- or his ability to directly communicate with the franchise’s employees. Schnatter relinquished his role as board chair of the pizza franchise last month after using the n-word on a company conference call. This development followed him stepping down from his CEO position on Jan. 1, following remarks that the NFL’s handling of kneeling protests during the national anthem was negatively affecting Papa John’s as a sponsor and advertiser. “I built Papa John’s from the ground up and remain its largest shareholder. I love my Company, its employees, franchisees and customers. “The Board wants to silence me. So this is my website, and my way to talk to you. “As I said in a recent letter, I miss you all very much. More than words can express! Papa John’s is our life’s work and we will all get through this together somehow, some way. I can only imagine how difficult this entire situation is on you, and I’m very sorry you all have to go through this. Know that in every minute of every day you are all in my thoughts and prayers. 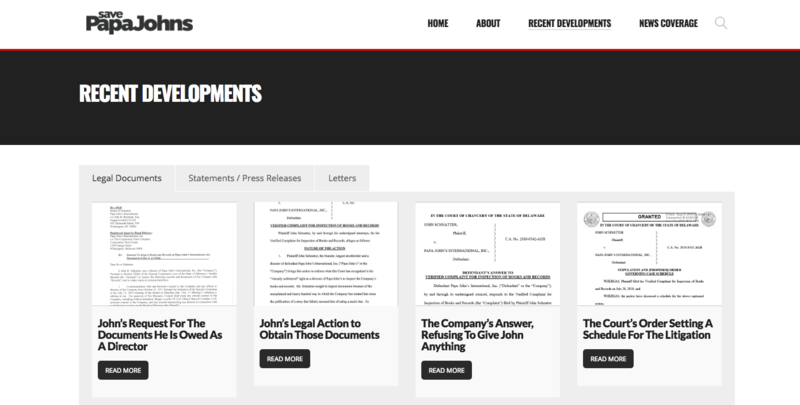 Other sections of the site include “About John,” which contains a biography of the 56-year-old founder and a bulleted list of honors and awards Schnatter has received; “Recent Developments,” where Schnatter has uploaded legal documents, statements and press releases and letters pertaining to his departure from company leadership (with titles such as “John’s Request For The Documents He Is Owed As A Director” and “The Company’s Answer, Refusing To Give John Anything”); and a series of links to “News Coverage” detailing Schnatter’s legal actions against the company and his unfavorable opinions of his successor, Steve Ritchie. These comments resulted in public accusations of racism by Schnatter and an embrace of Papa John’s by white supremacists, who labeled the chain’s fare the “official pizza of the alt-right.” Papa John’s publicly condemned this groups, and Schnatter stepped down from his CEO role two months after the earnings call. Never. We condemn racism in all forms and any and all hate groups that support it. We do not want these individuals or groups to buy our pizza. Also on the call, Schnatter reportedly detailed violent acts that he witnessed growing up in Indiana, including people murdering African Americans by dragging them behind trucks. Despite what he says were anti-racist intentions in making these comments, many interpreted them as inappropriate. Schnatter resigned from his board seat on July 11. Since then, accusations that Schnatter engaged in sexual misconduct and fostered a “bro culture” within the company have surfaced. Schnatter has disputed the allegations. Papa John’s has experienced losses attributed to Schnatter’s actions and reputation. Last month, it began offering its franchisees financial assistance to prevent closures.